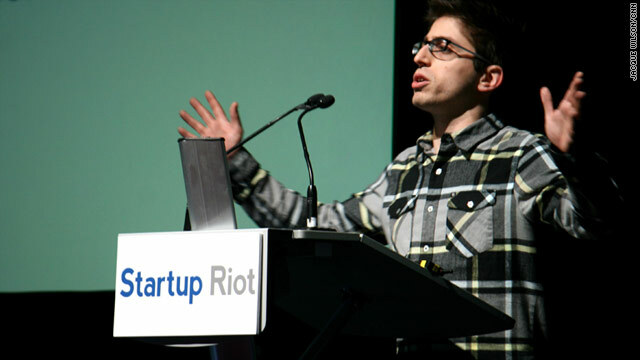 Adam Geller gives his three-minute pitch for R3 Collaboratives, a video platform for teacher training, at Startup Riot. Startup Riot provides "speed dating for entrepreneurs"
Atlanta event gave presenters three minutes to pitch ideas to a crowd that included "angels"
Atlanta, Georgia (CNN) -- You can call it "speed dating for entrepreneurs." Startup Riot brought together representatives from 50 internet startups at an Atlanta concert hall Wednesday to zoom through three-minute presentations about their products. The dream? That one of the dozens of investors in attendance -- call them "angels" if you're feeling upbeat or "sharks" if you want to get right down to it -- will rush up and write them a check to help make their ideas reality. Even more realistic results -- like a new contact, a word of advice or a first step on the long trail to venture funding -- make the event worthwhile, organizers say. "It's very rare that somebody's going to present and somebody's just going to give them a check," said Sanjay Parekh, the founder of Startup Riot, which is now in its fourth year. "It does happen -- some people have had that -- but it's such an aberration. But even if they don't give you money, they give you advice. They give you contacts." The event, held on Wednesday in downtown Atlanta's Tabernacle music hall, drew about 500 people. Parekh estimated that about one quarter of them were investors. And it shows what the startup tech company community calls a growing push to find talent outside of Silicon Valley in California, he said. Events in Chicago, Los Angeles and Austin, Texas (not to mention scores in India, Europe and Asia) are just some of the events that have cropped up in the past few years. 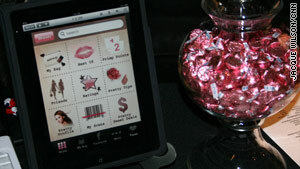 "Pretty In My Pocket," an app for cosmetics customers, was among hopefuls at Startup Riot. TechCrunch Disrupt, a series of startup-themed events hosted by the blog TechCrunch, will be held not just in San Francisco, but also in New York and Beijing. "It's interesting to me to see the development of outside-the-Valley communities and how they've grown," said Charlie O'Donnell of First Round Capital, one of the investors at Wednesday's event. Startup Riot was definitely interesting for the guys from Atlanta-based TripLingo. Their mobile app, a light-hearted travel tool that lets users translate English phrases into other languages, was voted the top entry by event attendees. Not bad for two week's work. The team from TripLingo was voted Startup Riot's winners. The app's working group formed February 1 at StartAtlanta, a smaller event where founder Jesse Maddox pitched his idea and others signed up to help. "It's been 120 miles per hour since the beginning," said Matthew Stigall, a member of the group. Maddox said his winning presentation for the app, currently in closed demo testing, felt much the same. "It just flew by," he said. "It felt like two seconds." They'll get nearly $15,000 in tech-related prizes and, maybe more importantly, more than seven hours of meetings with investors. The presentations, sandwiched in hour-long chunks around keynote speeches and other events, ranged from buttoned-down to frenetic, and the products were just as varied. How else to describe pitches that ranged from TeamEx, "an online strategy system that provides complete management insight" to "Pretty In My Pocket," a mobile app that lets users get feedback on lipstick and other cosmetics. Often, the passion was obvious. "I know from being on the ground that this is a need in the market," Adam Geller said in an emotion-choked voice as he wrapped up his pitch for teaching tool R3 Collaboratives. "I know from real teachers that they love this." And, who knows? It may be just that kind of passion that catches the eye of one of those angel-funding sharks. "It's funny because everyone asks what are you looking for," said O'Donnell, whose group has helped bankroll successful startups like Mint and StumbleUpon. "I just want to meet some interesting people doing some interesting stuff in the early stages. "Most of the best deals end up being in spaces you didn't know you were looking at."